Fifty chefs in the Arab-Israeli village of Abu Ghosh on Friday mashed up over four tons of hummus, beating the Guinness World Record set in Lebanon just months ago. "This is a new record," said Guinness adjudicator Jack Brookbank as the massive dip, dished out in a six-meter (20 foot) satellite dish provided by sponsors, weighed in at 4,087.5 kilos (8992.5 pounds). That is about twice as much as the previous record set in October in neighboring Lebanon, Israel's political and culinary rival. "I've heard Lebanon is already planning to strike back," Brockbank told AFP as a band struck up a traditional Arabic tune to words hailing the humble hummus. A simple but tasty dish of chickpeas, sesame paste, olive oil, lemon juice and garlic, hummus stirs passions and rivalries across much of the Middle East. Lebanon recently sought to have the European Union register the dip as a Lebanese specialty, drawing hoots of derision from Israeli aficionados, who claim that would be like claiming intellectual ownership of bread. Hummus, sometimes described as one of the oldest known prepared foods, is enjoyed in much of the Middle East and has probably been around for centuries. Most hummus pundits agree its historical origins are lost in the sands of time, with various theories mentioning several areas of the Middle East, Rome, Greece and the Crusaders. For Jawadat Ibrahim, who organized the event, the roots of the popular dish are irrelevant. 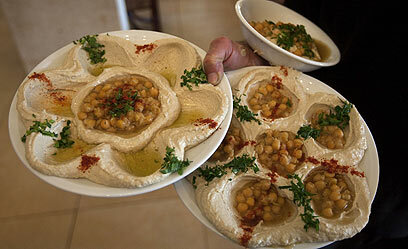 "It's something we all share and enjoy," said Ibrahim, who owns the Abu Ghosh Restaurant in the heart of the Arab-Israeli village of the same name which every weekends attracts hordes of hungry visitors, many in search of the perfect hummus. About 50 chefs worked side by side to prepare the massive plate of hummus set up on a specially erected platform outside the restaurant located just a short drive from Jerusalem. The Guinness official was impressed. "It's really very good," Brockbank told AFP. "I was a little worried they might sacrifice quality for quantity, but that was not the case," he said. "Abu Ghosh is the town of the biggest hummus plate in history," he shouted out to cheers from a crowd of several hundred. He acknowledged that Lebanese hummus "is very good" but boasted that "Abu Gosh is the hummus capital of the world" - fighting words to rival fans. With Lebanon apparently determined to one-up Abu Ghosh, Brockbank is convinced "it's going to be a long battle." "But a nice one," he added. See all talkbacks "Abu Gosh mashes up world's largest hummus "